In 2001, entrepreneur Tony Fernandes bought a debt-ridden airline company for only one Malaysian ringgit (0.26 dollar). Sixteen years later, from a staggering debt of 40 million Malaysian ringgit (11 mililon dollars), AirAsia has grown tremendously to reach a market cap of 11.6 billion dollars. From a single route between Langkawi and Kuala Lumpur, the low-cost carrier now flies to more than 165 destinations spanning 25 countries. Staying true to its tagline, "Now Everyone Can Fly", Malaysian low-cost airline AirAsia has made affordable flights accessible to the common folk within the Southeast Asian region. AirAsia is currently Asia's fifth-largest airline by fleet and passenger numbers – and has been voted as the best low-cost carrier in the world for the ninth consecutive time by Skytrax. This has helped to boost tourist arrivals in the 10 ASEAN (Association of Southeast Asian Nations) member states. There are many other low-cost carriers in the region that have directly and indirectly contributed to the transformation of the aviation and tourism sectors in these ASEAN nations. Companies like Lion Air (Indonesia), Nok Air (Thailand) and Cebu Pacific Air (the Philippines) are the change-makers in Southeast Asia while traditional carriers have also jumped on the low-cost airline bandwagon through their subsidiaries like Scoot (Singapore Airlines) and Jetstar (Qantas). 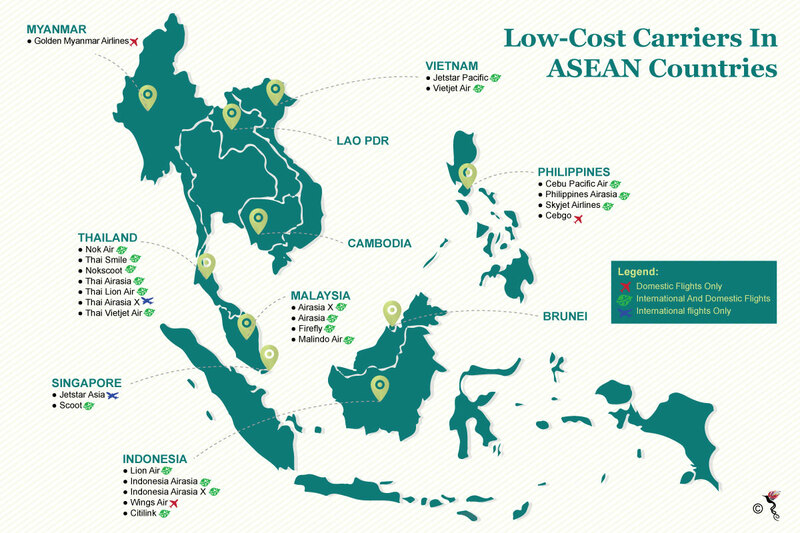 Low-cost carriers in ASEAN countries, as compiled from CAPA (Centre for Aviation). With the surge of low-cost carriers in Southeast Asia, expensive airfares and limited travel choices are a thing of the past. ASEAN’s low-cost carriers have been remodelling the region’s aviation landscape, transcending national boundaries and bringing affordable travel to the masses. As of March 2017, CAPA (Centre for Aviation) indicates there are 23 low-cost carriers under the ASEAN’s aviation sector. Moreover, according to a report by Australia-based think tank Centre for Asia-Pacific Aviation, two-thirds of all regional airline seats are supplied on low-cost carriers, which illustrate the growing demand for budget-friendly travel options. The rise of low-cost carriers could drive growth in the travel market in any given region. Southeast Asia already has a high low-cost carrier penetration rate where its capacity share of the total seats is approximately 57 percent. Cheaper flight tickets have directly boosted intra-ASEAN and intra-Asian tourism. In 2015, according to the ASEAN Secretariat, a total of 108.9 million tourists flew into ASEAN countries and 42 percent of these tourists travelled within Southeast Asia, creating strong market demand for travel and tourism. The total number of tourists arriving in ASEAN countries has increased by 25 percent from 2011. The ASEAN Open Skies policy – the region’s long-awaited single aviation market – is increasingly important to help facilitate growth and support the increasing number of tourists expected to arrive in the region – projected to hit 145 million tourists by 2023. The gradual liberalisation through the ASEAN Open Skies policy has yielded positive growth in the aviation sector with the introduction of competition among airline companies and lowering air fares for travellers. With Open Skies, airlines can add more flights to key destinations and profitable routes in Southeast Asia while meeting the growing demand within the region. With further deregulation and liberalisation in ASEAN’s aviation sector, airfares will become cheaper still. These regulatory changes have caused a surge in air travel as the middle class can now better afford to travel by air. According to a Nielsen report, the projected middle-class population for ASEAN would reach 400 million by 2020, which would help to expand the tourism and aviation sectors within the region further. As more travellers opt for air travel in the future, it only depicts brighter skies for the region’s no-frills carriers. For now, low-cost carriers are here to stay.